Just last week we watched the 3rd and final episode of Benny’s Restoration Nightmare on Channel 4. Where Sarah Beeny and her husband Graham Swift are determined to protect the heritage of Rise Hall. To give it a new, 21st Century feel and the income it so desperately needs to survive. They had just 12 months to transform this decaying mansion they call home (2nd home really) for their very first wedding event. The renovation was a mammoth task. Putting Sarah in the position of ‘Practise what you Preach’. The endless mansion had approximately an acre of leaking roof, a third of a mile of corridors, eleven main reception rooms, 32 crumbling bedrooms and countless bathrooms. 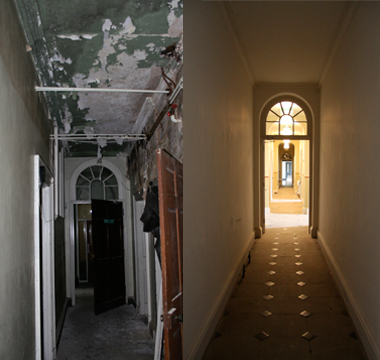 As well as a moss filled former gymnasium, this was to be turned into the main reception room. As a mum of a toddler myself, I had such admiration for Sarah. Taking on a project this big with 4 small children is definitely what I would call a mammoth task! The travel time from the house in London to Rise was approximately 5/6 hours and sometimes they would travel through the night with children in tow, to be there by morning to meet the restoration crew. I have to say though, the children looked like they LOVED being there – a world away from London huh! This stately home was an absolute mess; at first glance you didn’t think they would make it. Of course I knew they would, otherwise Channel 4 wouldn’t have done the documentary but I still really enjoyed watching each and every transformation take place. With my love for planning any kind of special event, I couldn’t wait to see the final showpiece – the wedding reception hall! Obviously I was keen to see the full restoration but I couldn’t wait to see the transformation of the once derelict gymnasium. I have to say, it was beautiful but I did expect a little more. Firstly, I would have lined the ceiling with fairy lights; flickering through the white material it would have given the room an intimate fairytale feeling. One thing I have learnt though, and I think is the secret to being a great Event Planner, is everyone has different tastes that may not necessarily be your taste! As hard as it is, there have been times I have had to just let go and do as the special lady wants. Rise Hall is a fine regency mansion with 32 bedrooms, standing in a glorious "Capability" Brown park, 6 miles east of Beverley and 8 miles north of Hull. Inside there are beautifully appointed rooms which are licensed to hold civil ceremonies and partnerships, and can accommodate celebrations from 10 to 200 people for a seated reception and 250 for standing. If I had to remarry my husband again, I would LOVE to have a venue like Rise Hall. Did any of your happen to watch this documentary? Would love to know what you thought?